Initial call on new refrigerator. New installation. Had a concern about quality of water being dispensed through the front door of the refrigerator. Turned out to be a non problem. 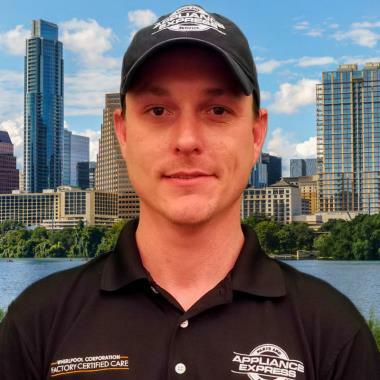 Clif Leatherwood of Appliance Express is very knowledgeable and he answered all our questions. He also give a lot of good information. Cliff fixed the washer, he was very personable, we felt like he truly wanted to find the solution and with persistence, he did. DRYER WHIRLPOOL WED8620HW0 Arrived on site to diagnose a dryer that is making unusual noise. Tested unit and found Motor vibrating abnormally. Install damper pad on motor mounting assembly and tested unit. Found all is functioning properly at this time. REFRIGERATOR WHIRLPOOL WRF540CWHZ00 Arrived on site to diagnose a refrigerator that is not cooling. Tested unit and found start relay for compressor shorted out. Replaced relay and tested unit. Found all is functioning properly at this time. No leaks were found at time of service. WASHER LG EIFLS55IMB0 Arrived on site to install new drain line homeowner provided for washer. Install drain line and tested unit. Found all is functioning properly at this time. No leaks were found at time of service. WASHER MAYTAG MVWB855DC3 "Arrived on site to diagnose the washing machine that will not turn on. Tested unit and found no power at wall outlet do to tripped GFCI breaker. Advised homeowner on manufacturers recommendation of not having a GFCI circuit hooked to an appliance. Tested all parts and functions of unit and found no mechanical failures at this time, and no leaks were found at time of service." WASHER GE GTUP240EMWW Arrived on site to replace water tube assembly for washer. Replaced part and tested unit. Found all is working properly at this time. No leaks were found at time of service. REFRIGERATOR WHIRLPOOL WRF757SDHZ00 Arrived on site to replace water line for refrigerator. Tested unit prior to replacing line and found air in main water lines for the home as this is a new build. This is causing air to enter unit and force water through the dispenser. Flushed all waterlines thoroughly and tested unit. Found all is working properly at this time and no leaks were found at time of service. DRYER ELECTROLUX EIMED55IMB0 Arrived on site to install control board customer provided for dryer. Installed new control and found control board homeowner was provided was defective and prevented unit from turning on at all. Homeowner will decide how to proceed from here as parts were defective. WASHER MAYTAG MVWC565FW1 Arrived on site to diagnose a washer that is not cleaning properly. Found all is working properly at this time. Unit hasn’t been maintained over time causing buildup of soap and soil in unit. Advised homeowner on best maintenance procedures for the unit. No repairs are needed and no leaks are needed at time of service. WASHER GE GTW330ASKWW Arrived on site to diagnose a washing machine that is not spinning. Tested unit and found wiring connections for motor were not seated properly from factory. Rewired unit properly and tested unit. Found all is functioning properly at this time. No leaks were found at time of service. FREEZER GE GFD28GSLDSS Arrived on site to replace three-way coil for refrigerator. Replaced coil and tested unit. Found unusual noise gone at all working properly at this time. No leaks were found at time of service.